Information for journalists concerning the Death Penalty Information Center's teleconference: A national poll of Americans' views on the death penalty. Teleconference will be held on Tuesday, November 16, 2010, at 10 AM Eastern Time. The teleconference will begin with short presentations by representatives of Lake Research Partners, the national firm that conducted the poll, and DPIC's Executive Director. Following these presentations, journalists are welcome to ask questions. Complete national poll results with additional breakdowns in death-penalty and non-death-penalty states (pdf). Complete poll results broken down by the four geographical regions of the country (pdf). Press Release concerning the poll results. Graphs and charts illustrating key findings from the poll (may be copied and used in stories referencing the poll). (Washington, D.C.) The Death Penalty Information Center today released the results of one of the most comprehensive studies ever conducted of Americans’ views on the death penalty. A national poll of 1,500 registered voters conducted by Lake Research Partners shows growing support for alternatives to the death penalty compared with previous polls. 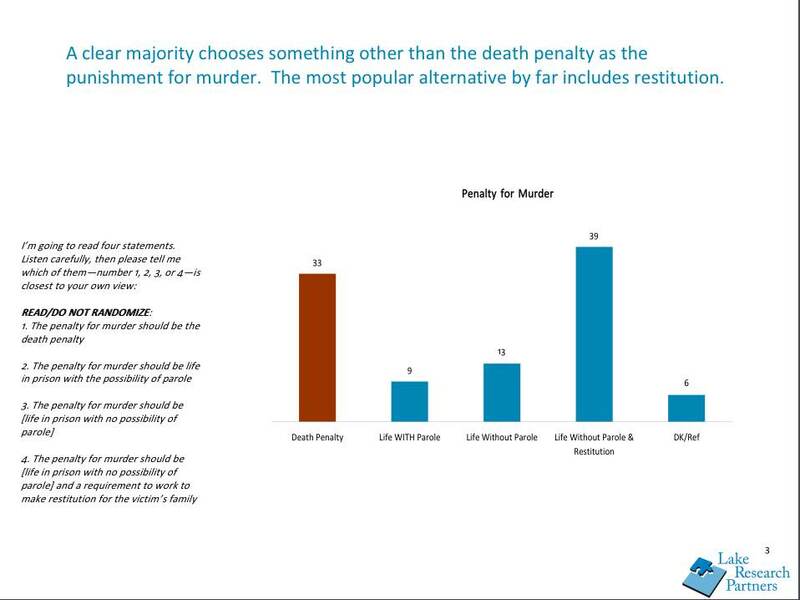 A clear majority of voters (61%) would choose a punishment other than the death penalty for murder, including life with no possibility of parole and with restitution to the victim’s family (39%), life with no possibility of parole (13%), or life with the possibility of parole (9%). 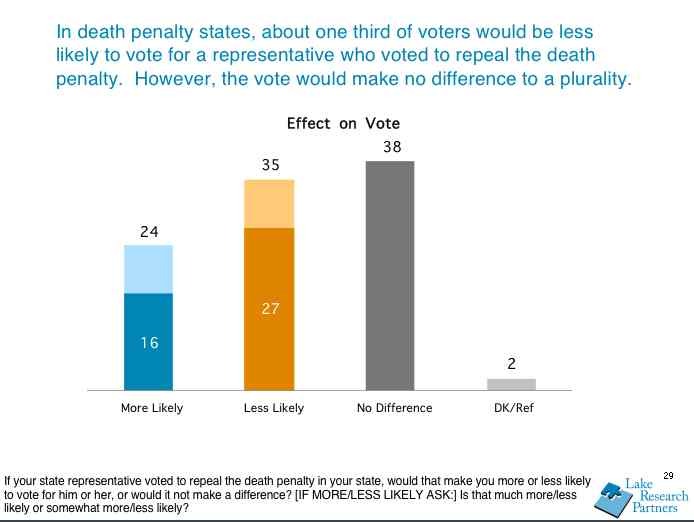 In states with the death penalty, a plurality of voters said it would make no difference in their vote if a representative supported repeal of the death penalty; and a majority (62%) said either it would make no difference (38%) or they would be more likely to vote for such a representative (24%). “For decades, politicians have equated being tough on crime with support for the death penalty, but this research suggests voters want their elected officials to be smart on crime, use tax dollars wisely, and fund the services they care about the most. Capital punishment is not a high priority for voters and is not the ‘third rail’ of politics,” said Richard Dieter, Executive Director of Death Penalty Information Center. “We see a real openness to considering life with no possibility for parole as a punishment for murder and a real awareness among Americans of the many problems with the death penalty. It is likely we will see Americans moving away from support for the death penalty as states and local governments grapple with tight budgets and as today’s younger voters and Latinos move into the core of the electorate,” said pollster Celinda Lake. Since the start of 2009, many states, such as Maryland, Colorado, Connecticut, Montana, Kansas, and New Mexico considered legislation to repeal the death penalty, and it is expected that trend will continue in 2011. Costs emerged as an important concern for a strong majority of Americans. Sixty-eight percent said cost was a very or somewhat convincing argument against the death penalty. 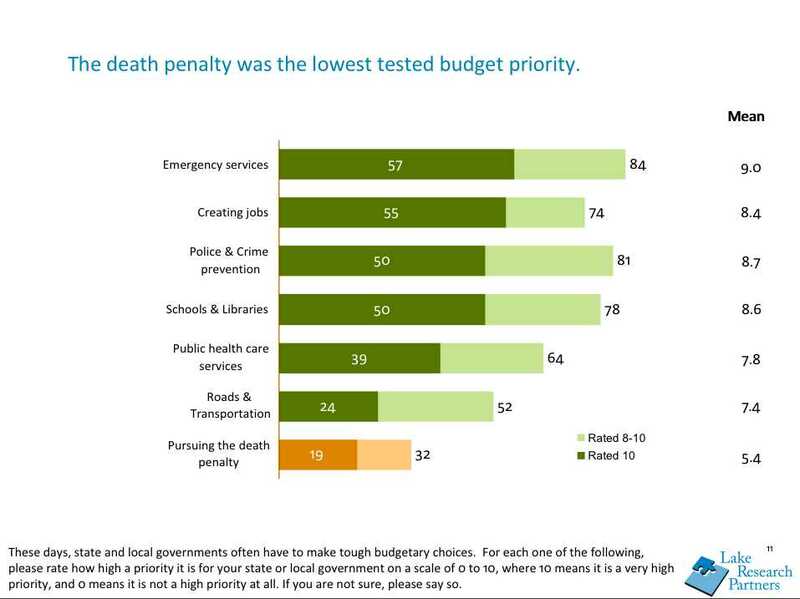 Voters ranked emergency services, creating jobs, police and crime prevention, schools and libraries, public health care services, and roads and transportation as more important budget priorities than the death penalty. 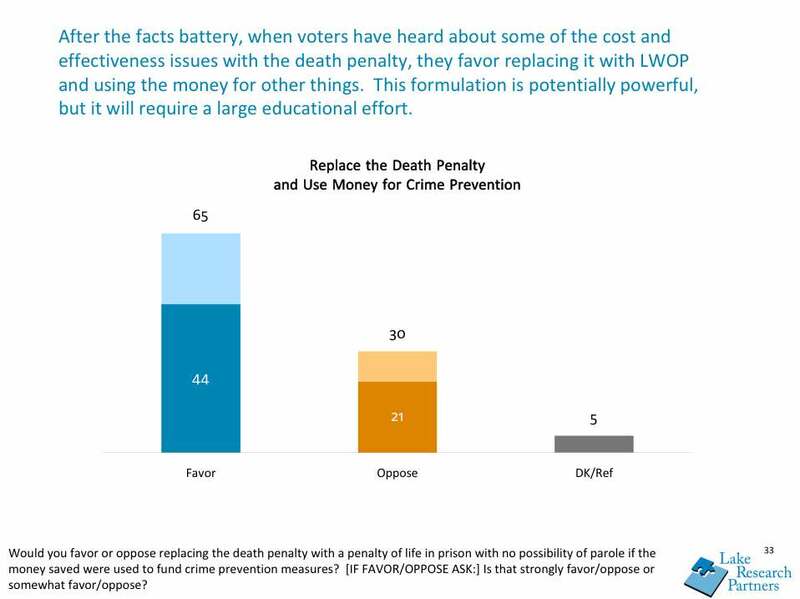 A strong majority of respondents (65%) would favor replacing the death penalty with life with no possibility of parole if the money saved were used to fund crime prevention programs. Hispanic voters were among those most willing to replace the death penalty with an alternative punishment. They responded most strongly to moral objections to the death penalty rooted in faith, as well as the argument that the death penalty is particularly unfair along racial lines. The poll explored the information that the public uses to make up its mind about the death penalty and the problems they see with this punishment. 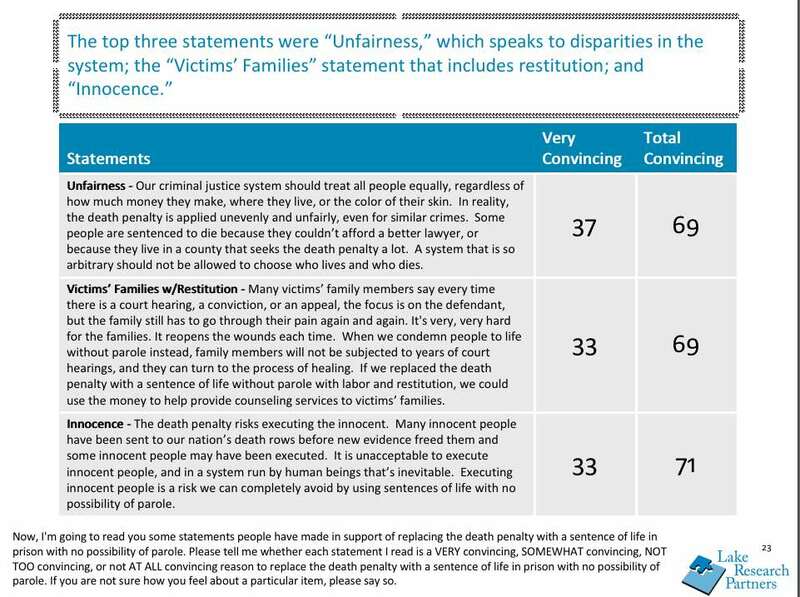 Some of the public’s top concerns about the death penalty were that it is applied unevenly and unfairly; it subjects victims’ families to lengthy trials and years of appeals that interfere with the healing process; and it risks executing the innocent. Spending millions of dollars on the death penalty, at a time when states are cutting back on services such as police forces, schools, and public health, and when life in prison would cost less, was also of concern to voters. Moral and religious objections to the death penalty were strong among Latino and Catholic voters. The nationwide poll of 1,500 registered voters was conducted by Lake Research Partners in May, 2010 with a margin of error of +/- 2.5%. Death Penalty Information Center is a non-profit organization serving the media and the public with analysis and information on issues concerning capital punishment. DPIC was founded in 1990 and prepares in-depth reports, issues press releases, conducts briefings for the media, and serves as a resource to those working on this issue. DPIC is widely quoted and consulted by all those concerned with the death penalty.